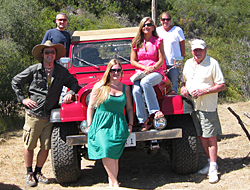 Join Cloud Climbers Jeep & Wine Tours, the Central Coast's original Jeep sightseeing tour company. For more than 10 years we have offered exceptional service and memorable adventures in our custom Jeeps. 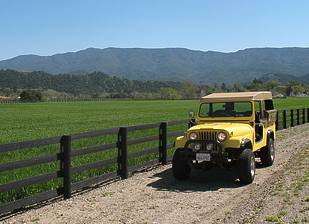 From off-road trails to lush valley vineyards, invigorating hikes to romantic sunsets, Cloud Climbers Jeep & Wine Tours offers, fun memorable experiences and unique adventures for all ages. We invite you to absorb the beauty of wine country and journey in our comfortable, safe, 5-7 passenger Jeeps for wine tasting Santa Barbara – the Back-Country Wine Tasting Tour. Otherwise, climb above the clouds to the top of the Santa Barbara’s gorgeous mountains – the Santa Ynez Mountain Tour or Sunset Santa Barbara Tour. This sightseeing adventure provides a special glimpse of Ojai which celebrates the history, flavors and many remarkable qualities that the beautiful Ojai Valley has to offer. It is a picturesque and engaging Jeep excursion that is both memorable and refreshing. If you find yourself further north, venture with us through the Ojai Wine region and beyond – Back-Country Wine Tasting Ojai! All tours depart daily and include door-to-door service within the Santa Barbara/Solvang or Ojai regions. Please note: Santa Barbara "region" includes Santa Barbara, Montecito, Goleta, Santa Ynez, Solvang, Los Olivos and Buelton. Ojai "region includes Ojai, San Luis Obispo, Templeton, Atascadero, Cayucos and Cambria". » Dress for casual fun!